A coalition of transit advocates and organizations in the city is coming together around a combined set of priorities to make the most of the city’s limited right-of-way. As Seattle grows, and especially as we approach the period of maximum constraint, we must aggressively shift our transportation investments to the modes that move the most people with the lowest carbon impact and in the least amount of space. The city’s budget and timelines for funded projects must emphasize guaranteeing right-of-way for people walking, biking, and riding transit. This means speeding up timelines for painting dedicated bus lanes and creating protected bike lanes. It also means protecting pedestrians in intersections and putting them first; adaptive signals are failing and, as NACTO recommends, are only appropriate for suburban settings. Read the whole letter here, or read more from The Urbanist, CHS, and Curbed Seattle. Yes, we just need drink more sugary drinks so [Mayor Durkan] can raid the resulting funds for transportation purposes. And if I-1631 passes we just need drive more to ensure yet even more “Move Seattle” funds are available. Yeah, and if we tax cigarettes to pay for health care, it won’t be a reliable funding source, and it won’t be enough to provide health care to everyone, so we should just stop taxing cigarettes and not fund health care. Is logic part of the public school curriculum any more? I guess that answers your question about public school curriculum. sugary drink tax — > more Anti-Vision-Zero road “improvement” like we’re seeing pop up all over town, costing pedestrians minutes to save drivers seconds –> driving becomes more incentivized so people get less exercise (unless they are driving to Planet Fitness or a hiking trail) — yeah, that would be a FAIL. Those projects are, unfortunately, already happening regardless of the sugar tax. sugary drink tax –> free transit for the poor and the kids — flows nicely. Move Seattle Funding –> aforementioned anti-Vision-Zero road projects –> Environmental groups gang up to oppose next Move Seattle Levy — That seems to be where we’re headed. Yes, the usual troll cop out in lieu of ignorance. If you really want to be creative and put a spin on it you can put the money into almost anything and claim its in the best interest of health and education. And Dorkin is just the person to do such. But there was never any intent to spend sugary fees on transportation. It was pushed as a source of education and nutrition funds. “Mayor Ed Murray signed the bill into law on Wednesday. I don’t see any articles that mention bike paths or turn signals, but then trolls should be discouraged to not read and state facts. This is a welcome effort. Where is the Transportation Choices Coalition? It seems like this would be a natural fit for them too. TCC has a Metro budget breakdown, that at least touches on the City budget. Bike commuting in Seattle is in long-term decline. Whereas adaptive signalling technology is proven to work, including for transit. Doesn’t sound like a very evidence-based set of priorities to me. Adaptive signalling is a computer program, enter in those requirements and it will do it. The currently technology is being used almost exclusively to reprogram our city streets to act like funnels to our highways, delaying and endangering people walking, biking, and taking transit. Seattle Neighborhood Greenways and MASS isn’t opposed to the technology, we just want it to reflect our values as a city and focus on safely moving people (not just SOV traffic). It amazes me how much whining about adaptive signals goes on — while the paint that marks crosswalks is often worn away, and tree canopies block street lighting making things dangerous for unseen pedestrians. A safe pedestrian environment should always be more important that waiting a few seconds at a signal. Drive a bus awhile and you’ll think differently about signal priority. Infuriating to drivers and passengers alike to have to stop the bus sixty feet from a bus-stop ’til the light turns green again. Not only is much operating speed lost, but every stop wears brakes, and every acceleration wastes fuel. “Inertia” doesn’t just mean pace of decision making in Seattle. Law of physics: No matter how slow you’re moving, going from a quarter mile an hour to zero takes enough energy to create a lurch. Same from zero to anything. Shouldn’t be a conflict, though. Except for the inertia that needs to be overcome to get decent driver training. Uhh… adaptive signals do not restrict transit signal priority at all. In fact, the equipment upgrades required for adaptive signals makes transit signal priority easier to implement because the more modern hardware is already in the signal control box! Didn’t an STB blogger just say they’d be cool with ST destroying the SODO bike trail? And exactly how is red paint safer (a word used in this post), for bikes than a concrete barrier? Sam. Proud New York Times Reader. There’s your problem, Sam. Your correct reading manner did indeed come from New York City, but you will probably have to search the archives for it. But you can certainly bring about its revival by selecting the most accurate sound affect for you getting run over by a steam-roller, thereby painting Third Avenue its appropriate color for blocking a high-speed reserved lane with this film cranked up. In addition, your kinfolk have a tragic problem. It is well known in the Nordic lands that morning sunlight turns trolls into a rock. Forcing Norwegian authorities to lie and call you a landslide because if dog-catchers were still elected- Joe, this form of selecting Troll-Control Boards still has its uses- that’s how much the cat will win by. But Norse legend also notes that if you stand under the Fremont bridge and read this linked page, maybe you can help him finish his Volkswagen for breakfast. Or instead of posting your next comment, just vandal-spray it on a pillar where he can see it. SHPLUUUUURKSWISH! How about thinking differently by doing objective evaluations and change the criteria or standards? A list of projects – most of which this is – is thinking exactly the same way that Seattle transportation advocates do. This letter doesn’t think differently at all. It blows its credibility by mostly just listing pet projects. That’s not good planning. In fact, some of these projects could actually increase greenhouse gas emissions. How about sector-based multi-modal transportation plans? Certainly, a wide involvement to cover entire sectors — all of Southeast Seattle, all of West Seattle, all of Northeast or Northwest Seattle, or Central Seattle. Even the One Center City idea is an example of moving to sector-based multimodal transportation plans. I don’t like some citywide advocate who lives 6 miles away and rarely visits my area of town telling me and my neighbors what’s best in a list of projects that they wrote down (and don’t understand the trade offs involved). I agree that the plans should be done in an holistic way. But I think most of what the letter addresses have already undergone study, or are fairly obvious improvements. In other words, I get what you are saying — and agree completely — but without specific recommendations, it all sounds like fluff. It is easy to call for a multi-modal solution for the city, but everyone has a different idea of what that means. Calling out specific proposals gives the letter more meaning. In general, I would say the specific proposals make sense. 1) No new adaptive signals until they study the effects on pedestrians, and mitigate the problems. That sounds reasonable to me (the city has been very good at moving cautiously — this seems right up their alley). 2) Fix Rainier Avenue. This is where I think you need to think bigger, because when they start taking general purpose lanes, you are going to have a conflict between bike lanes and bus lanes (see comments below). 3) Build up sidewalks. No additional studying needed, really, this is all about money. 4) Home Zone Pilot. Reasonable suggestion — again, it comes down to money (although in this case, not very much). 5) Missing Link. We all want this. Work is continuing, it is just a matter of whether there is another court challenge. In other words, the city is moving as fast as they can. 6) Delridge Improvement. I haven’t followed this, but it sounds like they just want this to be completed as planned. 7) Eastlake Bike Lanes. A lot like the last two items. They just need to get the work done. 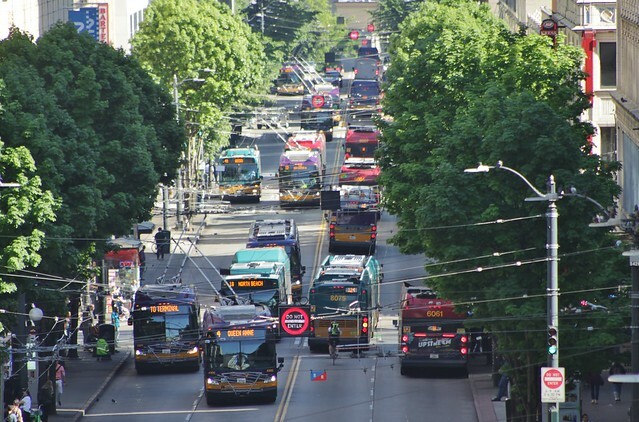 8) Extend bus lanes to Belltown. One of the few interesting proposals on the list, and one I fully support. This makes a lot of sense (as many people have said). If this is the only significant change that happens as a result of this letter, it will be a huge success (since most of the other suggestions will eventually happen anyway). 9) First Avenue Transit Lanes. I find it interesting that they titled it this way, as opposed to focusing on the streetcar project. In other words, this may be a subtle way of saying “kill the streetcar expansion if you must, but you better get those transit lanes”. I agree completely. 10) Build the basic bike network. Again, this is something that has been planned, so this is just a matter of money and prioritizing efforts. 11) Bike network to the Seattle Center. Basically a subset of item number 10. Ideally we finish the basic bite network soon, but if there is one area to focus on, then it is Seattle Center. 12) Bus lanes before we get the buses for BRT. Nice idea, and one I support. We still need to study any change, but curb side bus lanes (BAT lanes) are fairly easy to add (from a planning and execution standpoint). This may mean that some of the work needs to be done twice, as eventually we may move to center running buses, but having BAT lanes in the meantime sounds like a great idea. I think this makes sense for First Avenue, for example (add BAT lanes, shift a bus there, then eventually add center running bus lanes when we have a full fleet of them). 13) Create a community stakeholders committee. This sounds exactly what you want — more opportunity for folks in the community to offer input. 14) Affordable Transit — Not sure what specifically they want, since we already have low income ORCA cards. 15) More money for parks. Again, I’m not sure where we get the money. In general, all of the ideas sound good. The biggest weakness is that many cost money, and the city simply doesn’t have it. But a lot of the ideas involve relatively cheap things, such as adding bus lanes and bike lanes soon, instead of waiting until we can add something bolder (RapidRide+). The only tricky area on there is Rainier, which seems like it is headed towards an Eastlake type of collision between those who want bike lanes or bus lanes. Fifteen “options” is not a “plan”. It’s a Christmas list. This is a letter, not a 200-page report. It can’t list everything, and choosing specifics would be doing exactly the “pet projects” you derided. The city government and SDOT should govern and choose projects wisely. This is all about the criteria they use, and the priorities in budget and execution. That’s what the letter is trying to effect. How can you distinguish between pet projects from the common-sense things to do when they’re the same things? It even references a comprehensive set of guidelines, NACTO. I think it is important that the city establish a vision, and then work towards that. To a certain extent, the mayor has already down that, with the proposes congestion tax. The whole idea is that there be fewer cars headed downtown. If there are fewer cars headed downtown, then we don’t need as many lanes headed downtown. That has significant ramifications on various streets. Rainier Avenue and MLK come to mind. For much of the way, on both of those streets, it is two lanes each way headed towards downtown. That doesn’t make sense if the overall vision is to have a lot fewer cars headed downtown. It is also important to make changes in an area, not just a particular street. It is easy from an abstract standpoint to say we need more bike lanes and bus lanes, but those two ideas are often in conflict, as we’ve seen before. With Eastlake Avenue, for example, the city couldn’t add bike lanes and add bus lanes (there just wasn’t enough room). So even though Eastlake will eventually have one lane each direction (instead of the two each direction it has now), it won’t be much better for buses. In some cases (like Eastlake) there is little that can be done. But in other cases, the answer is to improve one street for buses, and another street (in the same neighborhood) for bikes. That could mean adding a bike lane to MLK, and adding bus lanes to Rainier. If you really have fewer cars headed downtown, then this sort of change will not make a huge difference for cars. If you don’t — if the congestion pricing idea fails — then this will help achieve the same goal. Most of Rainier and MLK are 3-6 miles from Downtown and are busy all day — not just peak hours. Downtown is already a quick trip on Link, and Downtown has a pretty low drive-to-work number (and probably lower from SE Seattle. These streets seem more crowded south of McLellan or around Othello than near I-90. Even thou the streets cross, they are separated by about a half-mile or more in many areas. The east-west connections are often narrow so it’s not reasonable to encourage more cut-through traffic. Finally, Beacon Hill is a big wall for mobility and any connections to Beacon Avenue are few no matter what the mode. This is important because much of the resulting MLK and Rainier traffic is local to SE Seattle. We can’t assess where traffic is until we study it though! This idea represents the same bad Seattle thinking: projects before full understanding or analysis. At least it involves thinking about more than one street at a time, which is an improvement over the current mentality of putting a citywide shopping list together at random after a secret coffee clutch of self-appointed advocates. Of course the issue has to be studied. Every change has to be studied — no one is suggesting otherwise. But one part of the study should be based on the assumption that very few people are headed downtown (by car). When that is the case, it is OK to have one lane each direction. Another study should look at who is effected even when people are headed downtown (as they are now). If it turns out only the folks headed downtown suffer a big time penalty, then tough luck. That is the point. Getting downtown, by car, should be rare — it shouldn’t require two lanes of surface traffic (especially very close to the freeway — the obvious alternative). I know the layouts of the streets (and the distances involved). But fail to see how changing each street to one lane would add to east-west cut through traffic. If anything, it is the opposite. If Rainier is changed to one lane, then folks will head towards MLK (which is two lanes). It does have ramifications for biking (there may be a lot of people who would prefer biking Rainier over MLK) but that seems like a 50/50 choice to me. It also has ramifications for north-south cut through traffic, but that can be mitigated fairly easily with some of the other changes they proposed (traffic calming steps that can go as far as blocking off the street to through traffic, as has been done in parts of Capitol Hill). The problem with Rainier is that it is being studied — and has been studied — but only in isolation. They also made the assumption that traffic to downtown will continue to be heavy, even though the city is in the process of making sure that it won’t. At some point it does get down to trade-offs, and we certainly don’t want to start a chain of heavy traffic problems in the area. But it is quite possible that traffic will only be especially heavy for those headed downtown (while buses travel in the next lane, not experiencing any congestion). In that case, tough luck. With regard to the pedestrian emphasis in MASS, where have I heard this kind of rhetoric before? Oh yeah, Vision Zero. Are you trolling Cliff Mass? This is hilarious. Where was this coalition when ST was formulating ST3? Because you know the #1 thing the region can do to “move the most people with the lowest carbon impact and in the least amount of space?” BUILD A FIRST CLASS SUBWAY. Don’t skip First Hill (again), don’t waste billions on few riders in WS, connect urban villages that have taken on growth, build a Metro 8 and UW/Ballard. What are we even talking about here? I don’t want to go on an anti-bike lane screed, but to highlight some people’s inability to use data to make effective decisions, look no farther than bicyclists’ inability to believe the latest census data around bike commuting. For myriad reasons apparently not having to due with increasing availability of bike lanes, bicycling is just not that popular in Seattle. Growth is not scaling with our investment in bike lanes. But taking light rail is extremely popular, and would be WAY more popular if ST would stop screwing up station routing and locations, and everything having to do with envisioning Seattle in 50 years. If only people could get as excited about light rail as they are about a damn bike lane. No kidding. Seattle needs to think differently, all right – we need to build at least twice as much subway twice as fast as we’re getting it, and we need local “arterial”-style service, so we can get around our own city car-free, instead of wasting so much money building all these long commuter lines out to faraway suburbs that will never be dense enough to make car-free lifestyles practical. Eh, Ballard to UW doesn’t even have STB support (Martin once called us “dead enders”in a podcast). Seattle Subway was toothless in its fight for it or the West Side transit tunnel or the subway 8 line. Do we really think that this letter is going to make that big a difference? I’d much rather see investments in pedestrian safety, from the light timing issues discussed here to at the very least completing sidewalks – not footpaths – on all arterials that do not have them before we put more money into bicycle infrastructure (let alone auto!). Pedestrians first – nearly everyone is a pedestrian at some point; then transit – most people do or at least can ride transit; then bicycles; and finally cars (trucks, etc. used for business purposes can slot in ahead of cars too). Help the most people possible get around easily and safely with the finite resources that even a city like Seattle has. Of course, the letter would be improved it is included the cancellation of the CCC Streetcar project. the capital funds for the alignment, streetcars, and revised maintenance bases, could instead be used for sidewalks on frequent transit arterials that lack them (e.g., Aurora and Greenwood avenues North), RR capital, and key segments of electric trolley bus overhead in Rainier Beach and the University District to provide connections with Link. per RossB, the 1st Avenue right of way could be used for the SR-99 routes as well as other funded routes now needing a reliable pathway. There is no fleet with left side doors. Much better 1st Avenue circulation could be provided. Streetcars are a very costly way to provide downtown circulation. Routes serving areas outside downtown can circulate through downtown provide distribution and circulation simultaneously with the same service hours. Good luck getting dedicated right of way without the streetcar. We would probably already have it, if the right-of-way was part of a bus project, not part of the streetcar expansion. We’ve already got that down, Ross. It’s what LINK wheels get stopped in while waiting for buses to stop for “runners.” Worked for joint use over cobblestones too. Didn’t scare horses at all. Well, since Breda’s aren’t there to panic the horses, transit used them to power a lot of service. Also, good way to reassure the public not to sweat construction schedules. Historic reference: When a ship-load of 19th century arrivals came on deck and saw the weather they’d just moved to, they let out a howl that made Chief Seattle’s tribe think the Great Dire Wolf (See Grateful Dead’s “Working Man’s Dead” album) had just padded in to eat the city. So let’s name it whatever Finnish is for that. I may be reading way too much into the letter, but it seems to me that the basic idea is this (with the obvious response in square brackets). 3) Kill the streetcar if you must, but get the transit lanes. [For the long term, this means having a RapidRide+ route use First Avenue. In the short run, it means BAT lanes (applying the same philosophy as the second item). It all makes sense to me. A big part of this is to build what we can now, instead of focusing on what will be built five years from now (and only then if we have the funding). In those, the idea is paint, paint, paint (for both bikes and buses) which is fairly cheap and quick to implement. But don’t forget this one, Ross. New York’s Boss Tweed’s days being past history, if not practice, I think he’d eat his cigar if amounts of money raised became primary campaign analysis. Would be better if the Supreme Court just amended Citizens United to keep donors’ names confidential, but Unconstitutional to say how much was raised. Would make it more fun for voters to bet on both receipts and results. Though would serve the State Lottery right if they had to get amounts donated by three million players on a single bus-wrap. But only on the metal panels because the courts have just ruled it freedom of expression and misdirection of fare revenue to put any of it on the windows. On the other hand, posted amounts give voters their first usable information as to who exactly has bought which candidate. Amounts say more than names of donors. Hey, just thought of something: Is there any penalty for lying about the amount of money you’ve raised? Hey, SDOT, bet you six hundred trillion dollars those grooved rails won’t ever have any wear but tire-treads! Which is all the TV news says I’ve got right this second. Which will make them walk right into bragging about how much they’ve got, touching off an audit that will make them beg to be prosecuted. Dirty game, politics.